Both want to capture the booming trend in lithium demand, but one is a much surer bet. About every few years, there is one commodity that captures the hearts of investors. The most recent iteration of this mineral lust is lithium. Lithium-ion battery technology has emerged as the predominant method for electrifying vehicles and energy storage for solar- and wind-power generation. With high demand for batteries comes high demand for lithium, and it has investors clamoring to own stock in the companies that produce the stuff. 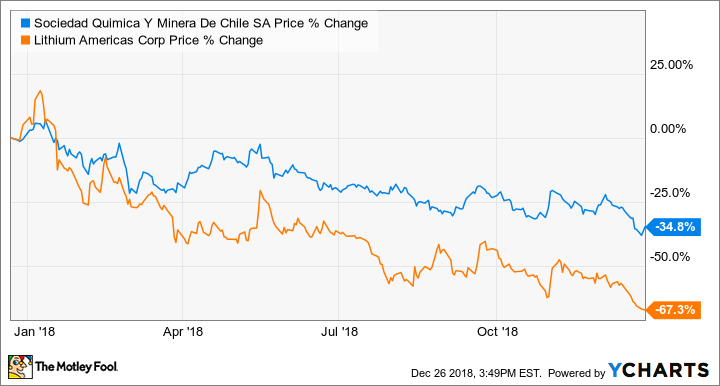 A search for lithium stocks will likely result in a small handful of companies, two of which are the well-established Sociedad Quimica y Minera (aka SQM) (NYSE:SQM) and upstart Canadian producer Lithium Americas (NYSE:LAC). For investors who may be wringing their hands about which of these two stocks is the better addition to their portfolio, let's look at their future prospects to see which one is a better buy. Lithium production is a niche part of the mining business. The least expensive source of lithium isn't mined in the conventional sense but harvested by letting brine water evaporate in ponds. The most cost-effective place for these ponds is in a region called the Lithium Triangle between Chile, Argentina, and Bolivia. Here, lithium content in brine water is high, and there's ample sun for evaporation. For decades, lithium has been a tightly controlled business in the region, but the recent demand for the battery component has led to a wave of backers trying to get their hands on permits to build new facilities. Lithium Americas is one of those companies looking to build the next wave of lithium facilities. It recently broke ground on a new facility in Argentina that will start producing approximately 25,000 tons of lithium carbonate, the preferred form of raw lithium for manufacturing batteries, per year. According to management, the facility will start producing in 2020 with low operating costs. If everything goes according to plan, it expects this facility to generate around $233 million in annual EBITDA. On top of that, it is also looking to build a conventional mining facility in the U.S. to extract lithium from hard rock. This facility is still in the planning phases, but management estimates that the first phase, set to start in 2022, could produce an additional $250 million in annual EBITDA and scale up to twice that size. Since both of these facilities are not yet operational, Lithium Americas has a market capitalization of just $200 million. After all, it is a start-up commodity company that has yet to produce a pound of product. For investors, there is a chance to get in very early and reap the benefits much further down the road. Aside from the lithium connection, SQM couldn't be more different from Lithium Americas. The Chilean company has been producing lithium as well as several other products in its brine ponds for decades, including industrial iodine, fertilizers, and other industrial chemicals. What's more, the company has a dominant market share with some of these products, a rarity for most companies that produce commodities. Product diversity that serves several end markets is also a handy trait in this business because it helps to offset when one or two of those markets are weak. Even though it is an established company with considerable market share, management isn't letting this surge in lithium demand pass it by. Between now and 2021, the company intends to more than double production from 70,000 metric tons of lithium carbonate to 180,000 tons by 2021. In addition, it expects to significantly expand production of both its iodine and potassium nitrate business. Perhaps the most compelling case for an investment in SQM isn't what it mines or its expansion plans but rather the company's established history of generating returns for shareholders. For the past decade, the company has generated returns on equity in excess of 20%, and that was before lithium became the red-hot commodity that it is today. As long as the company can maintain this level of discipline while expanding its operations, it could make a compelling long-term investment. Buy the upstart or the established player? As great as the opportunity in lithium might sound on the surface, neither of these companies is what you would call a slam-dunk investment today. SQM is an established leader in the lithium industry, with an enticing growth plan ahead of it and a history of generating returns for investors. The downside is that even after the recent decline in stock prices, SQM still trades for 23 times earnings. That's still not a great price to pay for a business that is so intricately tied to the volatility of commodity prices. Lithium Americas stock has the potential to be a great value at today's stock price, but a lot of things have to go right for that to happen. Since the company has no track record for developing projects or operating a lithium-producing facility, you're basically making a bet that things will play out exactly as they appear on management's investor slide deck. If the project were to go over budget or if it isn't able to produce lithium for as low a price as it claims once up and running, then those numbers on paper may be completely useless. If forced to make a choice between these two stocks today, I think I personally would go with SQM. While it isn't the most attractively priced stock, its track record for generating returns and its dividend yield of 3.2% means it will likely be a positive return stock over the long haul. Lithium Americas' offer looks appealing, but there is simply too much uncertainty right now without a producing asset. Perhaps once we see some significant progress toward putting its facility into operation on time and on budget, then it will be worth reexamining. For now, though, better to take the more sure bet.